Few people give thought to how we interact with today’s portable devices, and fewer recognize that the user experience in accessing these small computers is lacking. Because the Data Egg can be so far-reaching in application and so fundamental in improving ease-of use, it is wise to devote some space to describing in detail how today’s devices fail us in daily use, and how the Data Egg typing scheme can make a significant difference in the quality of life for those who use these small computers. A busy executive uses his Palm Pilot extensively to keep his appointments, and as his phone book, but one time while traveling he had a brainstorm of ideas he wanted to write down while standing in a long line at the airport. Not being able to take meaningful notes using the Palm Pilot’s Graffiti handwriting system (which might recognize 5 words per minute on a good day, but this was not a good day since one had was holding a briefcase, and two hands are required to use a Palm Pilot), he whips out his Data Egg Keyboard Peripheral, where he proceeds to capture his ideas at 30 words per minute for the next half hour as the airport line progresses. Taking his seat on board the airplane, the executive folds down the tray table, takes out his Palm Pilot, and then transmits the ideas captured earlier by the Data Egg into the Pilot. A final idea comes to him, and, while the two portable devices are communicating with each other, he types the idea into the data egg which then acts as a “real time” keyboard, transmitting the information to the device as it is being typed. Using today’s technology, most of that executive’s ideas would have been lost because there was no way to realistically take notes on the palm pilot. The scenario above made this worse because the executive had only one hand free, making it Palm Pilot use impossible. In this scenario, the Data Egg acts as a supplement to the handheld device already being used by the executive. The data can be transmitted to the handheld device via either a physical cable, infrared light, or a Radio Frequency link. To facilitate the kind of take-notes-wherever-you-are advantages of the Data Egg, a Data Egg in this scenario would have its own computer and memory so as to remember the notes for later transmission. 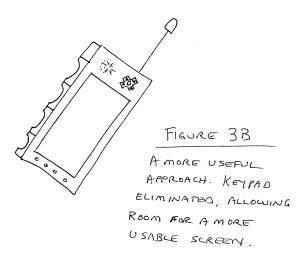 The above scenario had the Data Egg acting as a peripheral to an existing device, necessitating the user to carry around two separate devices in order to get maximum benefit. 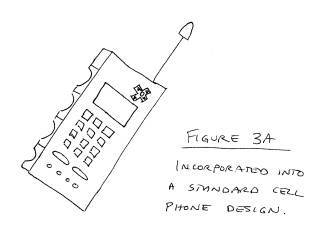 There is no reason why the functionality of the handheld device cannot be encapsulated into the Data Egg, so that only one small device need be carried without sacrifice of utility or performance. · Complete appointment calendar, synchronizable with common desktop calendar applications such as Microsoft Outlook. · Complete phone book, including reverse-search phone book file, so you can cross-reference who just paged you. · Travel alarms w/ reminders. Interval alarms for exercising. · Automatic Touch tone dialing - type in name, hold unit up to phone to dial out. · Games! Especially for the youth market. · Grocery shopping mode for Egg – Capture things you need during the week as you think of them; check off items, keep running cost total as you shop. · Electronic score keeper for 2- and 3-person games, especially miniature golf. The picture at the left depicts this kind of implementation. A restaurant critic had a difficult time being treated like just a “normal customer” by the restaurants she reviewed; as her constant notetaking while sitting at the table would always tip off the local staff as to her purpose there; blowing her cover and guaranteeing that her experience there would be anything but typical. Fortunately, our reviewer started learning to type on a Data Egg the night before (it takes about an hour to learn the basic alphabet), so she thought she’d try to take notes with the Egg instead. With her eyes on the menu and her hand under the table, none of the staff ever suspected that she was actually typing her thoughts with the hidden hand. With this new discreet notetaking tool, she ended up being treated like common folk, and therefore had lots of dirt to report in her column, which subsequently increased her reader following which led eventually to a raise. All because of the Data Egg. Real Estate agents are another good market for this function, as they are constantly driving around neighborhoods, showing properties, and taking notes from behind the wheel (sometimes while the vehicle is moving!). Using a Data Egg in this scenario is perfectly fitted to the needs of the traveling notetaker. 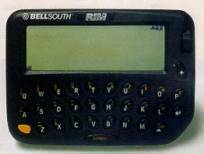 · Built-in alphanumeric pager (with automatic cross-referencing of names and numeric pages). Users can download, respond to, and upload e-mail messages in the background; answer messages while waiting in line at the airport. · A complete PDA as described in 2A above. Mr. E: Well, I appreciate the amount of work you’ve done for us in the past. Because of you we sold 100,000 of your sweatshirts last year, and we both made a killing. But that was last year. As you know, your contract ends tonight and I have already received better offers from two of your competitors for the same rights that are expiring with you. As a businessman, I’m obligated to go with the higher offer. It’s nothing personal. Nader: If I can ask, who bid what? Mr. E: Well, Sally’s Sweats offered me $50,000 for the rights; and Ben’s Britches offered an undisclosed yet higher amount but with slightly different terms. With this discreet and time-sensitive intelligence, Miles had the upper hand in the negotiations, was able to call Mr. E’s bluff, and everyone lived happily ever after. Needless to say, there is no way you can do this with any other computing device available today. · Text-to-Speech foreign language converter – type in the phrase in the language you know, have the speech synthesizer say it in the language you don’t. · Digital audio recorder: have it record sound for musicians who might forget that great lick they just thought of. · Camera time exposure control port - program the Egg to take “timed exposure” pictures using various over- and under-exposures. Makes for beautiful nighttime shots without the guesswork. All of these are features that you simply cannot get in a handheld unit today. Jane was traveling in Nepal as a tourist, but like most Americans, hadn’t bothered to learn the language before embarking. Instead, she had her Data Egg always at her side – it was the ideal companion for the traveler. She had the foresight to have added the Nepal Travel software module to the unit before she left. When Jane was at a store and wanted to know how much something would cost in US Dollars, she would discreetly take out her Egg, type in the price of the object in Rupees, and press the “convert” chord command to get the price. If there was no price tag, Jane would hold the object in one hand, and with the other hand type in the sentence “How much does this cost?”, press the “Translate” chord, and the onboard speech synthesizer would verbally ask the question in perfect Hindi. (The shopkeeper would then write down an answer using numbers, a response she could understand.) Jane also had the option of having the question “printed” on the unit’s display so as to not call too much attention to herself. The remarkable thing about the above scenario is that at no time did Jane have to put down her purse, packages, or object and scurry toward a counter or tabletop surface in order to realize the usefulness of the Data Egg. It is handy and usable in real-life situations, while standing, holding packages, articles of clothing, etc. No other handheld device on the planet can be used this transparently. The Nepal software module also has in it a complete travel guide, which is all searchable via keywords, and easily readable via the unit’s large display, which can display several lines of text and graphics at once. Jane saved considerable space in her backpack by leaving the travel books home and used the Data Egg to quickly look up information she needed. Imagine the poor cell phone user who is also driving his car, and needs to take his eyes off the road in order to take notes or even just to dial the next number. Imagine the poor cell phone user who actually tries to make use of his phone’s 2-way e-mail feature by trying to type a message onto the tiny keypad. John was just released from the hospital, having spent 3 weeks there recovering from an automobile crash. John was a Field Sales Rep, and made most of his business phone calls from the road. Although he used a headset while he drove, the headset did not eliminate the need to take his eyes off the road while he initiated and ended phone calls. The day of the accident was particularly bad; as John was hastily trying to write down a quick phone number during a call. That’s when a car cut in front of him and, because John’s eyes were off the road for the wrong few seconds, he was not able to react in time. John learns from his mistakes. He immediately went out and purchased a cell phone which had the Data Egg typing scheme built-in. Using the typing scheme, John can now dial numbers, type in a person’s name and have the phone dial that person’s number, and he can also take notes during a phone call, all without having to take his eyes off the road. Another great market for a Data Egg with communication capabilities would be Highway Patrol officers, who must routinely “run” license plates through the central computer, sometimes before the motorist is pulled over. Current police cars use laptops mounted over the transmission hump, where the officer is expected to take his eyes off the road, hunt-and-peck with one hand, and then read the results on the screen, all while keeping an eye on traffic. A Data Egg with a Speech Synthesizer and 2-way communication would be a superior solution; license plates could be typed in while the officer keeps his eyes on the road, and the results could be “spoken” back to the officer using the unit’s built-in speech synthesizer. In this scenario, the eyes never leave the road. Tommy the tourist is lost in a foreign country, looking for a national monument that nobody’s ever heard of. If he were by his desktop computer at work, Tommy would simply go to a web search engine and look up all the information he needs, and then print it out for the road. But because he has his Data Egg-based Internet Appliance with him, he can quickly do the same thing regardless of where he is. Tommy whips the Data Egg from his belt and, using the Egg’s chording method of typing, types in the URL for the search engine. 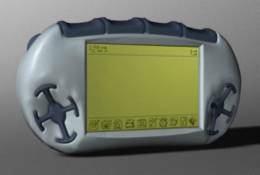 Because the handheld unit has a large, color touch-sensitive screen, Tommy can then use the index finger of his free hand to point to hyperlinks and surf the web from that point. Because the unit is “always on” via the built-in packet radio interface, Tommy does not have to wait for the unit to connect to the Internet in order to use it. Tommy can also check his web-based hotmail account using the web browser, and respond to any and all messages throughout the day as he takes periodic rests. But because the web is multi-media (rather than text only), Tommy can also send multimedia e-post cards via the unit’s built-in camera and audio recorder (see Usage Scenario #2C above). For example, when sending e-mail, Tommy can point the unit’s built-in camera toward the monument he just found, record a 10-second audible caption, and send both of these artifacts as attachments to an e-mail and off it goes. Tommy puts the Egg back in its holster and thinks of what to do next. Meanwhile, the Data Egg is transmitting the message to the Internet via radio slowly in the background while Tommy is free to concentrate on other things. Since Tommy doesn’t speak Lebanese, he can also leverage all the features that Jane found so helpful in Scenario #2 above. 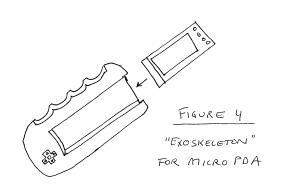 There are several existing products on the market for which we can manufacture an “exoskeleton” – an external peripheral which places the required buttons on the device’s exterior, and also adds software to allow the system to recognize the chording as inputs. As an example, to the right is a “Micro PDA” that is commercially available. It is the size of a PC card and can slip very easily into a laptop’s PCMCIA slot. It has its own CPU, display, batteries, and memory. It’s screen is touch-sensitive so you can point to an icon and then navigate within that subscreen. The only thing it’s missing is a good way to enter information. That’s where Scenario #5 comes in. 1) Easy manufacture – all the intelligence and development work already reside in the PDA. 2) Low cost – same reason as #1 above. 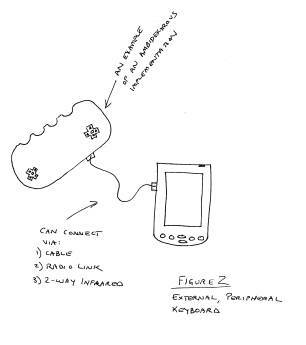 3) Right Demographic – “early adopters” who buy this instead of a Palm Pilot for the portability and convenience will be drawn to the low-cost Data Egg keyboard adapter for the same reasons. 4) Low risk for investors – relatively little R&D Required.